These days, there's more overlap than ever between the people who play God of War and the people who play games like Angry Birds and FarmVille. If you asked a random "core gamer" whether they played games on mobile devices like the iPhone or on social networks like Facebook, you might expect that the answer would be "not on your life." You might come to especially expect that answer if you spend time on core-gamer-oriented websites online. Interestingly enough, a new study shows that this may not actually be the case - traditional "core" PC and console gamers are slowly broadening their horizons to new platforms. 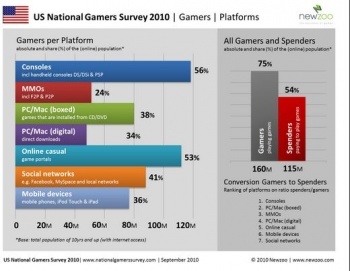 Newzoo's National Gamers Survey for 2010 polled "more than 10,000 respondents from national panels representative of the total online population of 10 years and older" to extrapolate the results for 160 million estimated gamers in the United States and their 32.5 million estimated counterparts across the pond in the UK. The study categorized them based on the sort of platform they used to play their games - MMO, online portal (like Kongregate), social media, etc. Since the categories were non-exclusive, any given gamer could be included in multiple groups depending on what they played. Consoles - whether living-room based or handheld - topped the list, with 56% those surveyed in the US and 62% of those surveyed in the UK saying they used a traditional platform for gaming. "Online casual" game portals took second in the US (53%) but were third in the UK (43%) behind mobile devices (48%) - which were fifth in the US with 36%. MMOs brought up the rear in both territories with 24% and 23% in the respective regions. Interestingly enough, Newzoo found that there was significant overlap between the "core" console gamers and the mobile and social gamers: 56% of console gamers in the US also play mobile games, and 59% of them play games on social networks. In the UK, 66% of console gamers also played games on mobile devices, and 56% of respondents said they played social games as well. All in all, Newzoo's study estimates that 87.3 million Americans and 17.5 million Brits play games on social networks, of which the most popular is Facebook by far. That's quite the number. I suppose it isn't that surprising when you think about it. These days, console gaming is more mainstream than ever before - and with the pervasiveness of social media in our culture and the sheer convenience of mobile games, is it any wonder that there would be some sort of overlap?